Yesterday I spent a little time with my dad. Before I left, he walks out of the room and hands me my grandfathers shotgun and says it yours now. Don't get me wrong, I always knew I would get it because it had been promised to me. My other brothers got other stuff, but this is what I really wanted. I can still see my grandfather slinging it to his shoulder taking down a squirrel or duck. He was a mountain of a man to me, and passed away many years ago (1977). But my memories are still as vivid to me as they were when I was a kid. It is nothing fancy, just a Winchester model 12 20 gauge, but it is priceless to me. It is Granddaddy's gun!!! Very cool and it's a slick shotgun. The Model 12 in .20 is hard to beat. very nice. don't just let it sit in the safe and be a talking piece take it to the woods and let her bark. my grandfather passed last year and I got his pre 64 model 70, I am taking it to Africa this year. Awesome. My in laws surprised me with one of my Grandpa's old Belgian made Brownings for Christmas year before last. I felt the same way. Matter of fact they almost got my eyes to leak a little. It is going to be my go to shotgun for this dove season coming up. I can't wait. My grandfather never hunted dove that I know of. Not to many in the bottoms & creeks of Louisiana. So I might have to take it squirrel hunting this year. I have the very same gun in 12 gauge that was my grandfather's favorite gun. I bought a 16 gauge and 20 gauge to have a nice set to pass on some day. You have a good looking and special gun. Congrats sir. I'm and old guy so vintage blued steel and walnut firearms are my first and nearly only choice. You youngsters can have all the plastic and tacti-cool stuff. We can't begin to know the memories that holds for you, but I understand how you feel. I have several pics and part of a shirt that my uncle gave me. Very cool. My Dad passed away a year ago tomorrow and I got several guns that I had seen my whole life. Most prized is a .30-30 that belonged to my great grandpa. Made in 1904 per the serial number. Stuff like that and yours mean more than our new, flashy guns any day. Enjoy!! Thats some good bull !!! Cool shotgun. Nice. The memories and connection make it priceless. I ended up with a few of my grandfather's guns this year. First thing I did was take them out and shoot them. Was a blast shooting those plain ole no frills pieces of wood and metal from early to mid 20th century. Congrats on a fine gun. Nice 20 gauge models are always hard to find. I have one like it in 16 gauge. When I was a kid the local policeman Slim Sanders in our little town carried it around as his firearm. I have my Grandpa's 16 gauge, I know exactly what you mean. i hear you i,m 60 something and just sighted in my grandpas old pre 64 mod 94 30/30 only gun i remember him deer hunting with. hope to make a pig pay. good stuff there. I can totally relate. I have on old 8mm mauser that my grandpa brought home from WWII. He used it to bring deer meat back to camp. That gun probably isn't worth much but means the world to me. That’s great stuff. Thanks for sharing. yessir……what a great family legacy!!! ...seems like a lot of us have been handed down guns. I have gotten my GREAT uncles double barrel .410......my favorite! My grandpa's .22 pump Remington...…….clean as a whistle. And also my wifes grandpa's WWII rifle. Sweet! I've got my great grandpas model 1897. Wish it was in good enough shape to shoot. Cherish it. I know it's just an old Mod. 12, but am sure it's priceless to you. My story is I grew up learning to shoot my dad's Win. Model 62A 22 pump rifle. I knew one day that it would be mine. It was a wedding gift from my Mom to my Dad. I had no brothers, just sisters. When he passed away after a month or so, I went to the house to get the rifle.......it was gone. One of my sisters had take it for my nephew. What can you do. Get'er done before the passing. I wouldn't be surprised to learn that it hasn't been turned into beer money. Probably worth a trip to a gunsmith to see what it would take to get it back in some type of decent shape. 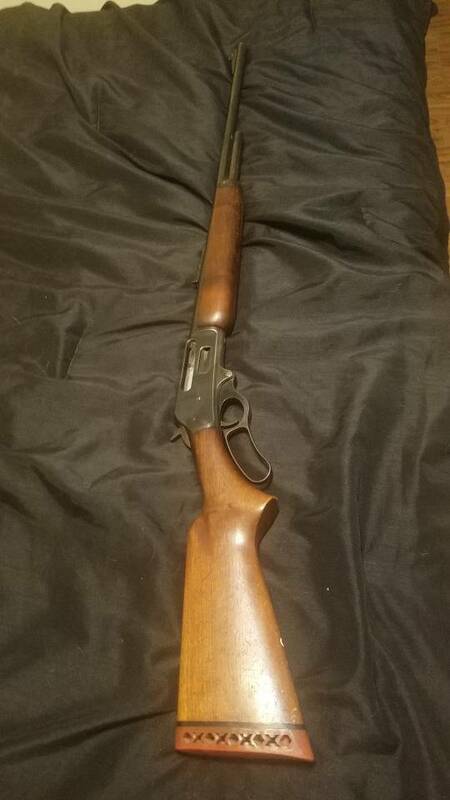 Model 1897 12 gauge with the slam fire option? We have one in my family as well. Beautiful. My brothers and I each have a model 12 from grandpa. All 20ga. I also have 12s in 28 and 16. Those never get shot though. I've had it looked at. Gunsmith said maybe with some really light shells, but as bad as it looks I don't want to risk it. It's a great keepsake for the time being. I know the feeling. I have some fancy guns in my safe, but the guns most valuable to me are only worth $100-200. Awesome to get that kind of hand-me-down. Congrats. My pawpaws LC Smith sxs 12 gauge. This thread needs more photos! My grandpa's 35 Remington bought in the 50s for $35 financed $5 a week till paid for. Cherish it. My Dad's model 12 in 12 gauge was stolen from us in Memphis. I have several old guns coming my way, but I hope it is years before I get them. the prize of the bunch is a hammerless Smith and Wesson 38 Smith bought in 1902 in San Francisco of all places. My Great Great Grandfather bought it the day he got his Taxi license. We still shoot it once a year. I have the original paperwork, the original permits, and his Taxi license.